Villa del Mar – the 4 star beach hotel at the polish Baltic Sea, with Swimming Pool, Sauna und Spa awaits you for a fantastic beach vacation, an unforgettable spa holiday, the experience of peace and relaxation in a small hotel with few, but very comfortable suites. 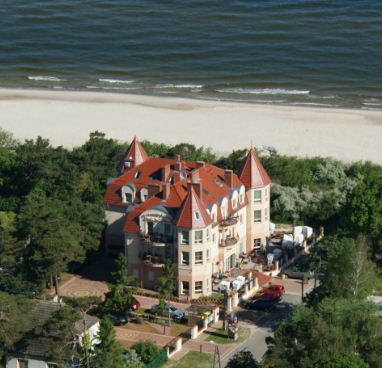 The Baltic Sea holiday in the sunny seaside resort Niechorze is worth a trip every season. The mild climate and the excellent quality of the air at the Baltic Sea – in particular, directly on the Baltic beach – are the fountain of youth for your wellbeing. The most popular beach resort near the German border, the former fishing village and today’s resort Niechorze. An infinite long, wide and white beach awaits you. Right at this beautiful beach is the beach Hotel Villa del Mar, architecturally a much-admired new building in the style of ancient villas – from the towers of the larger suites you will have a panoramic view through 5 windows to the beautiful Baltic Sea beach! The hotel Villa del Mar is located next to the nature, and is equipped with modern wellness facilities and spacious as well as comfortable suites. Each suite has its very own decoration – but they are carefully matched and all decorated in warm Mediterranean colors. In addition, an elegant restaurant and a cozy café awaits you in our hotel. A sunny beer garden with many beach chairs both provide protection from the wind and cozy corners for a chat, also belongs to the equipment of our beach hotel. With only 15 suites our hotel has a familiar atmosphere – Wating and scramble? … – Wrong! – Everything runs very relaxed. There are usually only about 20-30 guests simultaneously at the hotel. Baltic holiday as relaxing spa vacation is of course very very important in our beach hotel: The 29 degree hot pool is 10 m tall and 4.5 m wide. Tall enough for the relatively small beach hotel in the seaside resort Niechorze. Mostly you will find yourself alone in the pool and you can, swim against the counter current system or get a shoulder massage from the waterfall. Next to it is a 35 degree warm Whirlpool for relaxation with additional underwater massage nozzles are switched on when required. The Finnish sauna has enough space for smaller groups – next door is the relaxation area with relaxing chairs. A bio sauna with color therapy completes the wellness program. Massages as well as body treatments Massages and body treatments are carried out sensitively by trained physiotherapists in elegant massage rooms. This romantic, small Baltic beach hotel is also the perfect place for a romantic weekend or relaxing weekend for lovers and anyone who wants to breathe new life into his relationship. A generous duo bath in our private spa, with pleasant music, a glass of champagne and candlelight enliven any relationship to pleasant way. Also sporting guests will enjoy their stay at our beach hotel, because we offer a gym with various cardio and strength training equipment. The public sports center of Niechorze is within walking distance and provides almost all sports, from soccer to tennis to Skaterpark and much more. The beach on the doorstep is of course ideal for all types of water sports. For cosmetic treatments, massages, exfoliation, etc. two massage rooms are ready to meet all requirements of a relaxing wellness holiday in Poland or on the Polish Baltic coast. Newly built outdoor tennis courts can already pre-booked at the reception, to make sure that they are available for you during your vacation. The tennis courts are located in the sports center Niechorze, only a few minutes from the hotel. For people with physical disabilities (e.g. wheelchair) there is only Suite 1 available. The other suites on the upper floors are not accessible due to the lack of a lift. The wellness area with swimming pool is located in the basement is also inaccessible for wheelchairs. The suite 1 is barrier-free with sufficiently wide doors and barrier-free access to the terrace. The restaurant and reception are also barrier-free. In addition to that the restaurant has a toilet for the disabled. The highlight of the holiday in our hotel is of course the location right on the beach. The beach is only a few steps away. You can relax in the sun, go swmming, also with your dog. The waiters will bring you drinks to your sunbed if you want to. Shower, toilet, and your apartment are only a few steps away, so you have all the amenities directly. The beach consists of fine-grained white sand, ideal for children to dig, it is stone free and goes flat into the water of the Baltic Sea. Neither rock nor groynes endanger you and your children while bathing in the Baltic Sea. After 50 m a sandbank on which you can easily stand. Thus, the power of the waves is somewhat reduced. During high season every 600-800 m are restaurants with drinks, small snacks, coffee and ice cream available. Very close to the beach hotel Villa del Mar is a beach chair rentals. You can set up beach shells, and other equipment without any beach regulation. It is possible to play beach volleyball, ride banana skis and jet skis (about 600m from the beach hotel). Bouncy castles and a large water slide for children are available on the beach. Most parts of the beach areas are monitored in the season by lifeguards. There are several on-site ATMs where you can withdraw with the debit card or credit card money (zloty, PLN). Smaller amounts can be also exchanged at the reception of our hotel. In beach Hotel Villa del Mar you can pay all benefits in either euros or in Polish zloty. For younger guests ther is a colorful playground with swings, a slide and a climbing wall outside of the Hotel. Whether wellness holidays, family vacation or just a weekend, you will spend an unforgettable time that will leave you in a magical memory in our beach hotel at the Baltic Sea. 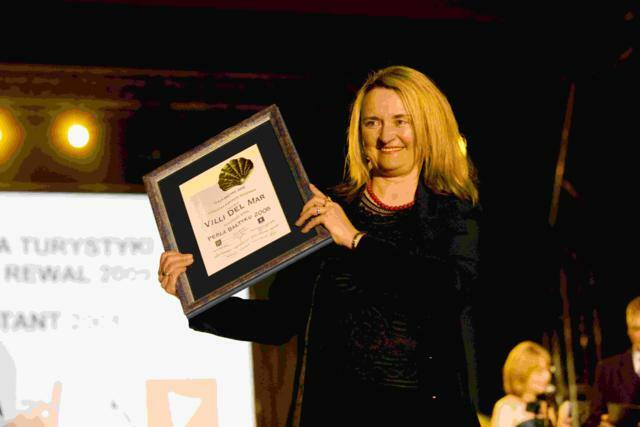 The Baltic Sea beach Hotel Villa del Mar has been elected at the annual Tourism Gala in 2009, so in the spring after the completion of the villa, the most beautiful tourist object holiday region Rewal-Niechorze with the connected 7 resorts and received the award “Perla Baltica ” (“Pearl of the Baltic”). Most suites of Villa del Mar offer a beautiful ocean and beach view.